CheezWaster received this My First Dino Kit for his birthday. I had been saving it for a rainy day or wicked hot day and yesterday turned out to be the perfect day to try it (since our Board of Ed screwed up my plan for the day by altering the time of pre-school orientation without notifying the parents). 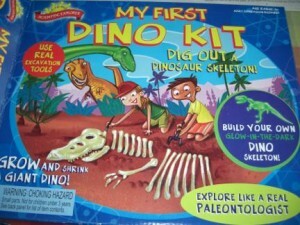 This kit includes 3 activities - a real dinosaur dig for bones, a build your own glow in the dark dinosaur and a grow a dinosaur. 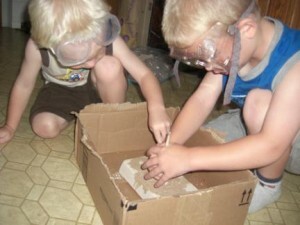 The kit also includes a pair of safety goggles and 2 tools - a brush and a digger’s pick - for the dinosaur dig activity. We started out with the grow a dinosaur activity. I mean who doesn’t love these little things that grow in water. I know I do. Ours is still “growing” in the cup at home. Tonight we will measure to see the difference in size. Then, we moved onto the dinosaur dig. 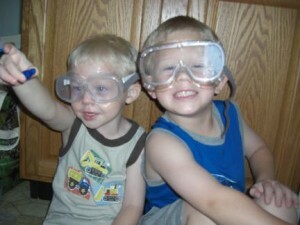 Safety goggles are a MUST! Then, we began our intense hunt for dino bones. I grabbed an old cardboad box for this, as it was quite messy. You definitely want to keep this contained. My one negative comment about this set was that it only came with one digging tool. 2 kids - 1 tool = major problems! 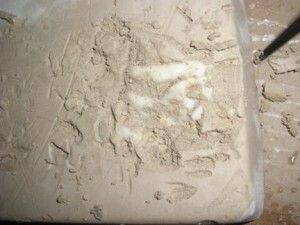 The Destroyer was only happy so long using the brush before he, too, wanted to dig. We improvised and I gave him a wooden chop stick which worked great! Conflict successfully avoided! We dug on this thing for a while and it really kept the kids’ attention. We’re still not done, so big plus for mom that this activity will spill over into another day! Is that a dinosaur bone I see??? Eventually, we put the glow in the dark dino together, too. And when I say “we”, I mean my husband. Given my limited engineering skills, I had to call the man in for this one. All in all, I think this kit is great. It is reasonably priced AND educational. AND it was great fun for a toddler and pre-K-er. It would make a great birthday or Christmas gift, especially if you’ve got a dino lover! This would also make a great dinosaur birthday party activity…hmmmm….this has got me thinking. I do have 2 winter birthdays coming up! Dinosaur Dig has been posted in Crafty Mamamamahoney, Kiddie Mamamamahoney and Tagged: dino dig, dinosaur, dinosaur dig, dinosaur dig kit, dinosaur kit, dinosaur party, gifts for boys, gifts for pre-K, gifts for toddlers, great toddler birthday gifts.